Some folk are just too cool for words. Although not seeming to actively pursue perfection – that would be incredibly UNcool, their every move thrums with beta-test brilliance. Pile of pre-Man Booker/Pulitzer prize short-listers: check . Tickets to the next big thing in live music: check. The predicted must-paint colour: check (emerald green, apparently). All of this effortless, osmosified, probably genetic. I was never that girl. And truthfully it doesn’t bother me. I’ve always, unfathomably, been comfortable in my own skin. Still am. I blame my parents 😀 But I secretly hate to be left sitting on the curb when it comes to food and food trends. Just not for the reasons you may think. Trends are for insecure people who can’t get dressed without consulting Grazia magazine. Like the unerringly au courant and fabulous Diana Henry, I would like to imagine I am above trends. Sadly, I am not. But I am back to front. I read trends to confirm and pat myself on the back for how groovy and with-it I am (see, I just can’t be cool. I don’t even have the language for it), not to tell me what to do. And then I immediately want to move on. Unless it is kale. Kale is a keeper. Kale is above cool. When I read or hear that something is cool or on-trend – hate that phrase! – that’s my time to move on. 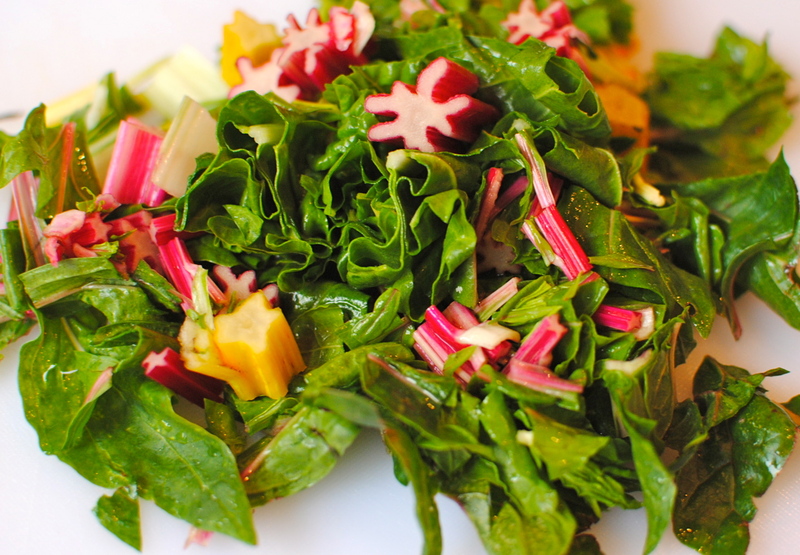 homegrown rainbow chard – lush! Apparently last year was all about comfort food, meatballs and offal (really? ), and this year we are not only going to go ga ga for vegetables but also pursue all things southeast Asian, Middle Eastern, Brazilian and pickled (Ms Henry has you covered here, see Ren Behan’s review). Other ahead-of-curve trends I have unwittingly been a party to are meatless, free-from, Szechuan, homemade and artisan bread (a humdinger of a recipe up soon), natural, chilli, and sweet and savoury. Oh, and allegedly foraging will be passe, so no more free wild garlic pesto or dandelion burgers for you. But no problem because artisan producers will arise to take the place of things we find and let go mouldy. So, when at your weekly farmers’ market (a big trend still) expect more of the likes of maple syrup cheddar, Satan’s Blood hot sauce and kitchen sink pasta from which to choose. So, by just being me I am suddenly a bit trendy. And as you read this and also like vegetables and real food, you too are cool. So, let us celebrate our place in the sun, because rumour has it that 2014 will be, whisper it, the year GMO goes mainstream. You heard it here first. Shhh. What do YOU predict will be big in 2013? Wholesome and tasty late winter-early spring (!) 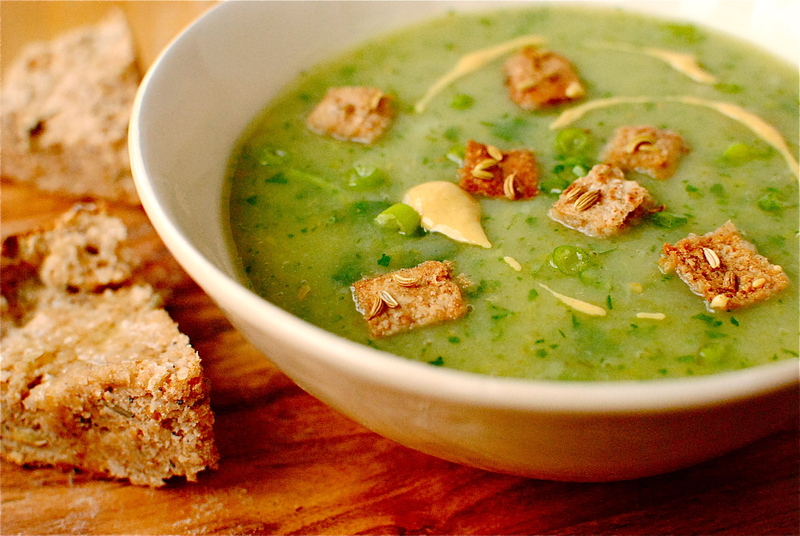 soup featuring any greens you like, but with the gentle kiss of fennel seeds and the slight chop-smack of Dijon mustard. The accompanying fennel seed pitta croutons are advised, but not essential. Or you could try my Spelt Soda Bread (pictured, with caraway and other seeds added) – very quick. Dairy-free, fat-free and gluten-free, but most definitely not taste-free. Bring the stock to a rolling boil and add all but the watercress, mustard and seasoning. Bring back up to the boil and then cover and simmer for 20 minutes. Add in the watercress and mustard, and blitz with a hand-blender/immersion blender/stick blender. Check the seasoning (you may find it needs no additional seasoning if your veggies are top notch) and adjust as needed. Fennel Seed Croutons: Split a wholemeal pitta bread around the seam and open out (or use a piece of day-old bread). Cut or tear the two halves into bite sized pieces, dab each side with a little olive oil or spray with oil spray, and press a few fennel seeds on each crouton. Or you could lightly oil a baking tray and scatter over the seeds, pressing the croutons onto the tray, turning to coat. Bake at 180C/350F for about eight minutes or until completely firm and starting to colour. Hail kale! Like Ellie Goulding as well. I hate the free-from as a ‘healthy’ way of eating trend. Me too. Of course if one has allergies or brutal intolerances (me and chickpeas!) that’s fair enough, but to actively cut stuff out because it’s trendy? Bahhh, bahhh I write up many of my recipes with options to exclude certain things with my cancer nutrition folk in mind, who can sometimes not tolerate – at least temporarily – lots of foods they might have before treatment. And I also write with those who have coeliac in mind, but with alternatives for those without such restrictions. But never for the sake of following fashion. If you saw my wardrobe you would know that’s never an issue! LOL! Well Djokovic was put on a free-from diet in preparation for his Wimbledon success, so much so, Andy Murray followed suit and went onto win the year after..
No-one can digest gluten, it’s just that for some it’s more severe. So, If you can’t digest it then it makes your internal system sluggish so why put yourself through it?! Free-From is Not a fashion, it is simply that the NHS & the likes offer free testing if you have symptoms and thus the knowledge is more available to more people. Thanks Kellie, I’m looking forward to making the Vegan soup. P.S. As far as I’m aware, I’m not allergic to anything..
Great to hear from you Lorna. I had heard about the diets the tennis players were adopting and how much more energy they were feeling, so there is definitely something to be said for gluten-free for many people.I think anyone who is chronically tired, has sluggish or altered digestion, unexplained skin problems, headaches, should speak to their doctor about being tested for intolerances, and go from there (as you mentioned). What I don’t quite get is free-from as almost an accessory, like a handbag-sized dog or animal print shoes, something to be done for a while and then dropped for the next trend. Like Niki writes, it makes those who have diagnosed intolerances and gut dysfunction feel like others see them as faddy. Health is too important to approach it as a trend. I get concerned about people who drop loads of things thinking they are being healthy but not replacing it with alternatives, just leaving it out. And I get a bit annoyed with how some manufacturers have jumped on the bandwagon with free-from products that just aren’t healthy (which is fair enough), but marketed as a healthier version. But there is also the other side that it broadens out choice for people who previously had none, even if it’s not the healthiest stuff. Your cakes are brilliant and not in the category of which I write. You use real foods but just in a different way to how many people approach baking. Any Edinburghers wanting a real treat should go to LovePureCakes.com. Although your cakes are gluten-free, we like them just because they taste good! 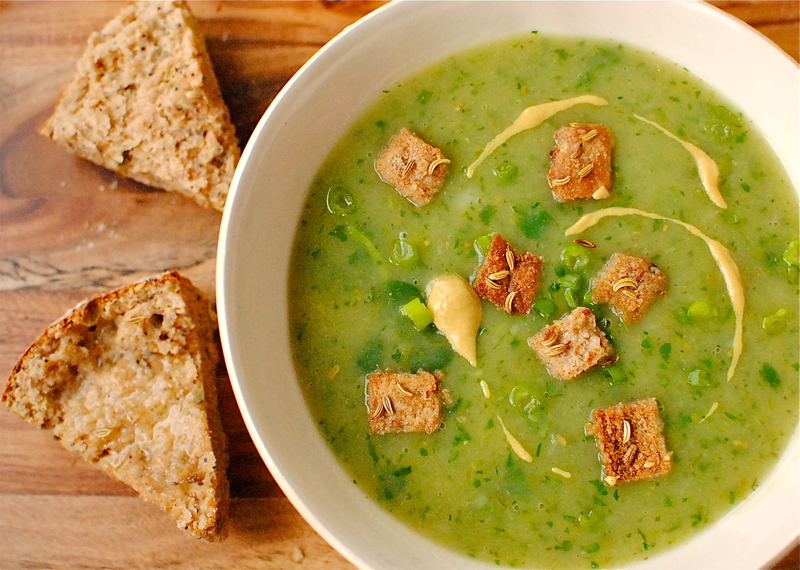 It must be in the air as I made a huge green soup yesterday (mainly leeks) with croutons made from Genius Seeded Bread, yum but I will try your lovely recipe too. I’ve just read Sally’s comment and I must say it’s a real shame for folk who genuinely do have intolerances because I have noticed quite a lot of people judging our sons WF, DF diet as a fad which makes me want to scream because it’s a very real condition that we keep testing and I can scientifically say that omitting wheat and dairy genuinely changes his life for the better. Yes, I know how much your son’s life has changed for the better after going WF and DF. It is night and day really. You had a lot of hassle getting there but your instincts as a mother have paid off, and basically you have helped him save his gut! I was speaking to a man today who was diagnosed as coeliac over 40 years ago and he has noticed how over the past couple of years people jokingly comment about him being a trendy eater. He just rolls his eyes. PS definitely a soup day! PPS Nardoo spore pods? What’s that?? ps as for 2013, well we have a wine made from nardoo spore pods sitting in the wine rack…. Gorgeous! Looks like “Green Goddess” Soup. Must bookmark this for our vegan challenge! And as far as being “big” The World Health Organization (WHO) has deemed 2013 “The Year of Qunioa”. 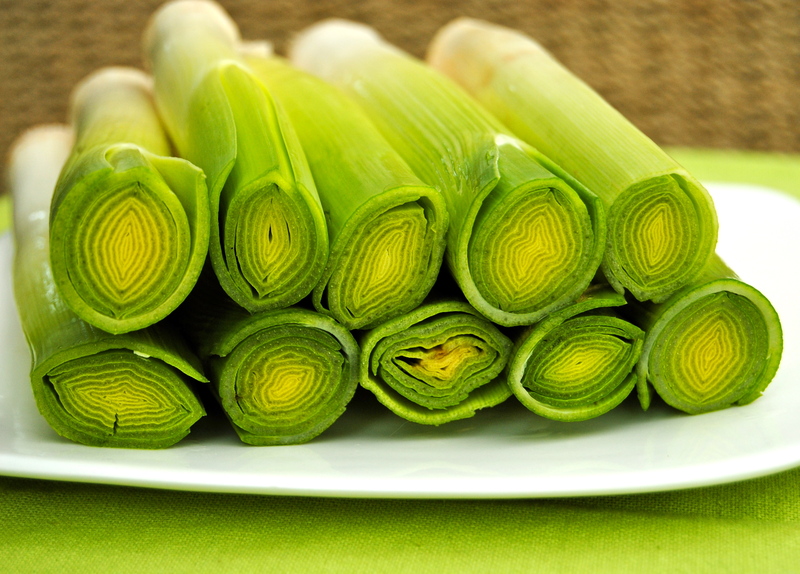 Damn….I’m a slave to trends…..
Those leeks are stunning. I would love a big bowl of that for lunch today please! That’s certainly a bowlful of healthy greens. Looks great. This soup looks divine!! I wish I was eating it now! Love the ingredients and colors! 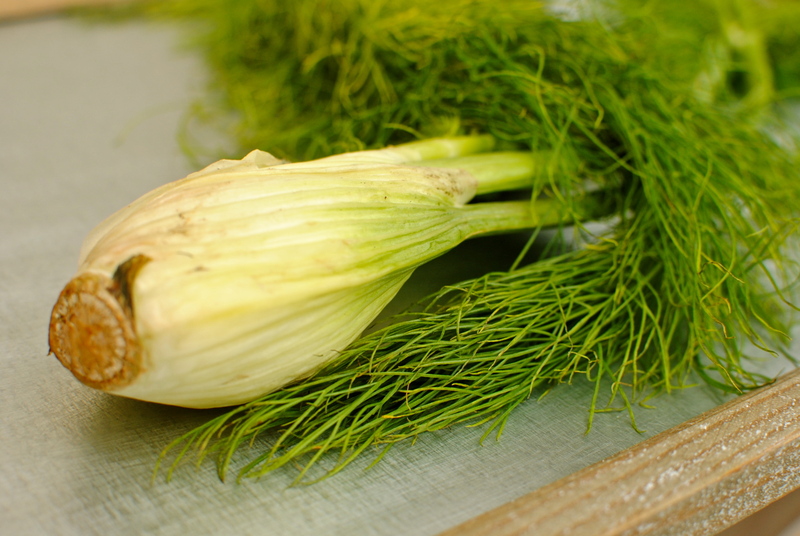 Such a gorgeous green and love the addition of fennel, one of my favorite flavors. 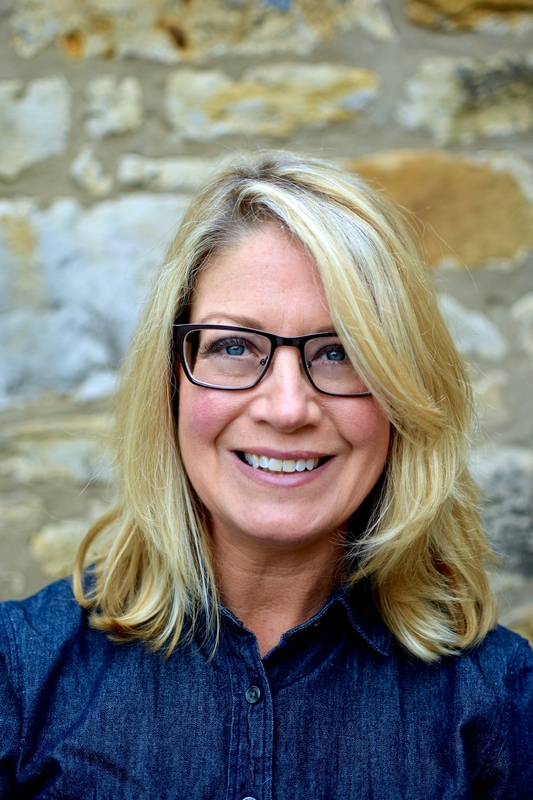 LOVE your snark and sarcasm Kellie-I’m sure there is not one mean bone in your body 🙂 Happy to celebrate this year foodie trends with you, including our beloved kale. Who says were not cool??? Well your take on food trends was so sweet and I feel like such a grumpy puss by contrast 😉 It is funny how we often mirror each other, and how often I take the sarcastic road there! But you know I mean no harm. 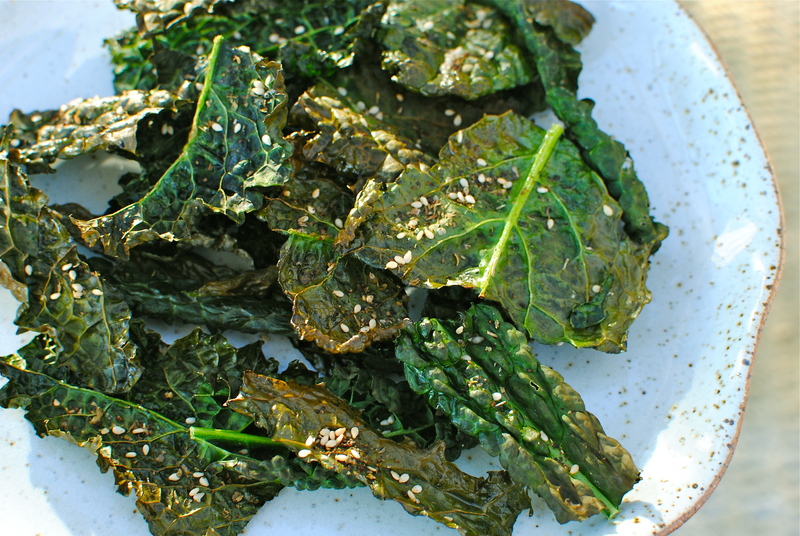 Just my strange attempt at humour…ps kale does, and always will, rock. It is so fantastic when the family likes not only the same foods, but also wholesome, green foods. It doesn’t hurt that you’re a chef! I am looming forward to my new chard crop (awhile yet) but my cavolo nero is still hanging in there. I wish we still had our allotment plot as there is so much more that we would like to grow. But it’s probably more opportunity for me to kill things. Oh, how I love leeks, and my Peter doesn’t like them! I try to sneak them into various dishes but he always knows. Gah! What a shame. Did he have a scary leek incident in his childhood? Love the use of fennel and leeks in this soup – they’re both favorites of mine and I’m glad to see they made the cut 🙂 And I mostly ignore trends. Well, besides recognizing that they’re there and what’s happening 😉 Thanks again for sharing another delicious meal! Oh, this looks like a winner! I just adore the vibrant color of the soup! It’s adds a very nice touch of glamour to all the healthy veggies. The flavor must be irresistible and that’s what takes a recipe from just ok to regular rotation in meal planning. Well done Kellie! That looks so fresh and peppy – if I can dig my car out of the snow this weekend I may just have to go on the hunt for more kale! 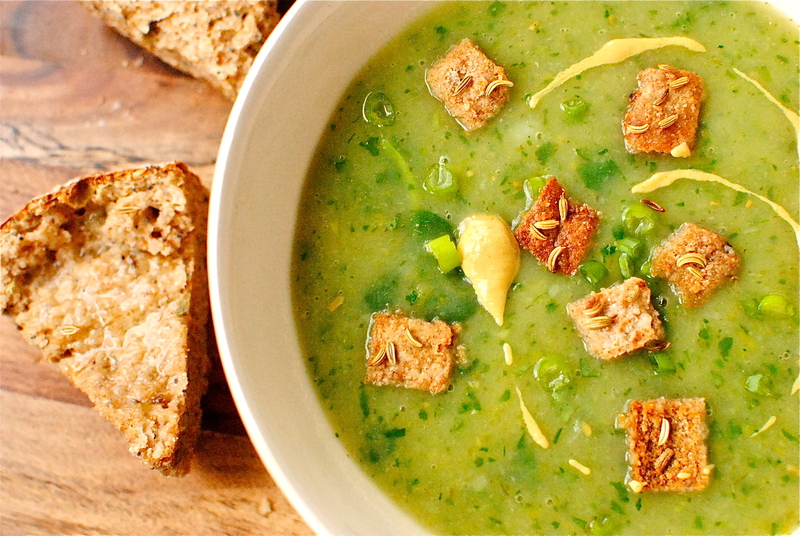 Your soup looks so wonderfully nourishing and delicious! That’s so good! That is so kind of you to let me know you tried and liked it. It’s still soup weather here so might make another batch this weekend. the soup looks realy delicious … i’ll try it. thank you for posting!